Sports acupuncture is used for injury treatment, prevention and (in combination with Chinese herbs) to improve athletic performance.2 Acupuncture taps into the body’s natural ability to heal itself. It can work in conjunction with Western medical treatment, and in cases where rest is prescribed for an injury, acupuncture reduces pain and accelerates the healing process without side effects. 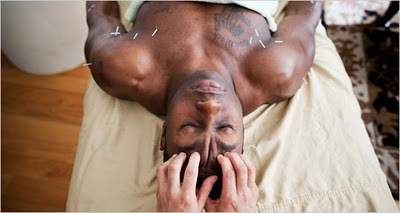 New York Jets fullback Tony Richardson receives acupuncture regularly between practices and before games. The practice of acupuncture views pain as an imbalance or interruption of one’s qi (life force energy). The insertion of acupuncture needles triggers the release of pain- and inflammation-fighting chemicals in the body, and restores the cyclical flow of qi, allowing the body to function at more optimal levels. A qualified acupuncturist will first conduct a thorough intake and evaluation of symptoms, then create a targeted course of treatment for maximum results. This is an original article from Dreamclinic, Inc. Dreamclinic is a Health and Wellness company committed to sharing information about commonly experienced health conditions and how they may be impacted through the use of bodywork and other natural approaches. Dreamclinic offers massage, acupuncture, and Reiki sessions at its Greenlake and Queen Anne clinics, as well as onsite massage at workplaces around Puget Sound. Contact us to learn more about how Dreamclinic can help you, your family or your workplace experience greater health.